As always the holiday season passed quickly, maybe too quickly. After weeks of cookies, roast dinners and catching up on my favorite restaurants in California, I’m more than ready for wholesome nutrition- food that makes you smile inside and out. I’m not crazy about setting resolutions every year; I’d rather check in periodically throughout the year and set new intentions. Putting all the pressure on one month is just too daunting. Besides, why save all that healthful goodness for one month? Kale often features as one of the main stars of the January New Year’s Resolution mandate for many reasons. It’s healthful- no denying that- and in vogue at the moment. The grocery stores in California have piles of it lying about in the produce section. Two for one! Eating big bunches of lovely curly kale is somehow- even to me- construed as the best way to offset all the gluttony of the holidays. There’s one more thing kale has going for it- it’s here! Kale is nonexistent in Germany so these days I’ve been whipping up kale salads, scrambling it with eggs, and tossing it in big pots of soup. This dish picks up on a trend I’ve been following: massaged kale salads. It sounds crazy but the principle behind the salad is easy. 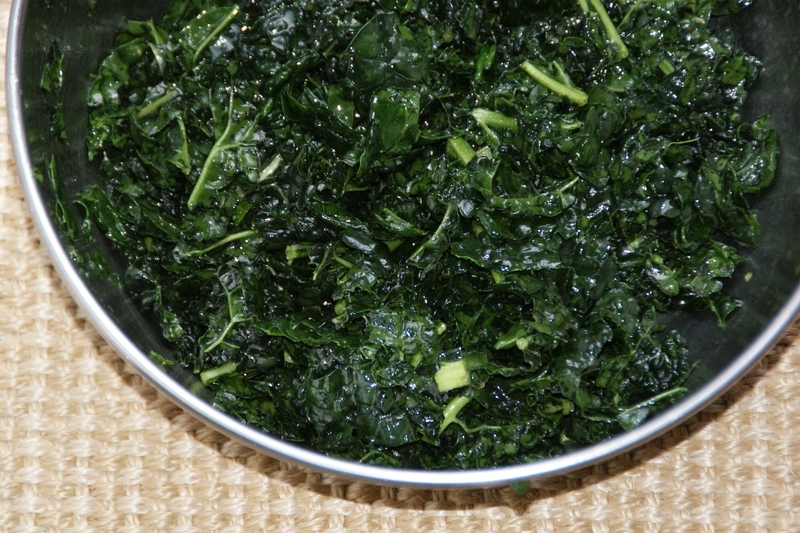 Wash, devein and chop up your kale, drizzle it with olive oil, lemon juice and sea salt in a large bowl. Now it’s time to get your hands dirty. With your hands, massage the kale for a good four to five minutes. As you massage the kale its structure will go from being tough and fibrous to supple and tender. It’s really amazing. The massaged kale can keep in a sealed airtight container for 4-5 hours and you can dress it however you like. For this salad I wanted something hearty and filling, with some warm elements. There’s nothing worse in winter than a cold salad. 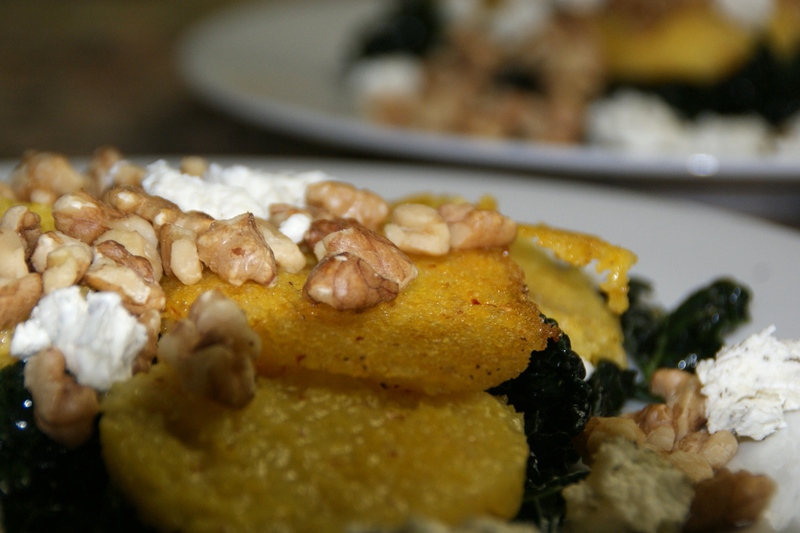 So here I topped the massaged kale with slices of polenta, roasted walnuts and creamy herbed goat cheese. It’s rich and satisfying but healthy, so apt for this time of year. 1. 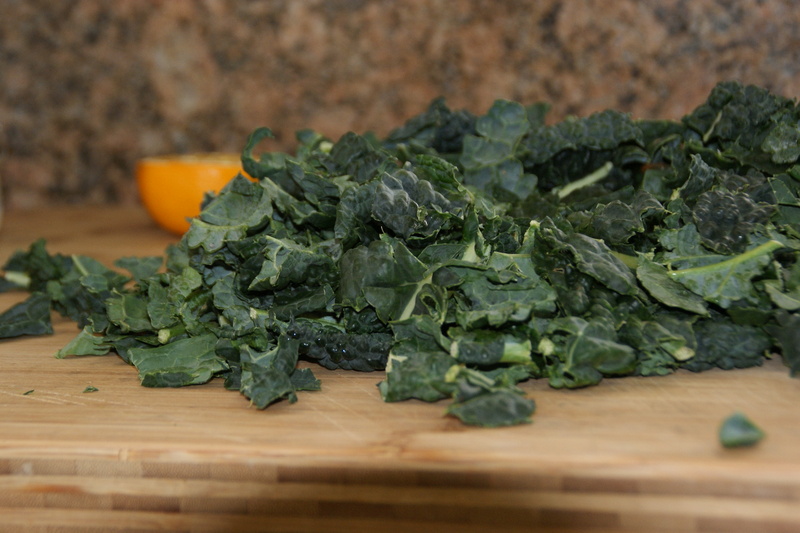 Massage the kale with 1-2 tablespoons of olive oil, the juice of one lemon and sea salt. Massage for 4-5 minutes, until its color darkens and it softens completely. Set aside. 2. Slice polenta into circles 1/2 inch in width. Heat 1 tablespoon of olive oil in a large skillet over medium heat and then sauté the polenta circles until lightly golden brown. 3. Divide the massaged kale onto two plates. Top with polenta and crumble the goat cheese evenly over both plates. 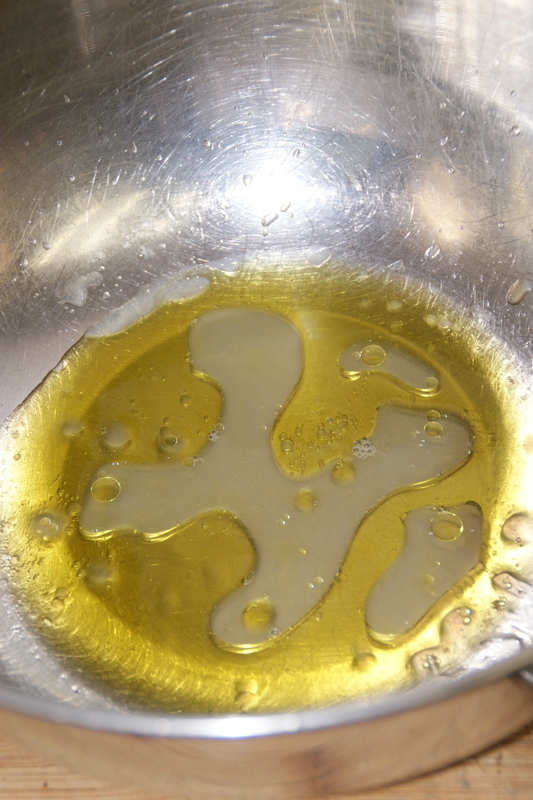 Sprinkle with walnuts and drizzle with olive oil. Eat right away. I am sooooo going to make this!!!. Stephanie will love it, let’s hope the rest of the family will too. Steph makes Kale Chips and the kids love them. Thanks for this post. Have a safe trip back to Germany.